There are biographies of Aelred of varying length in Wikipedia, the Catholic Encyclopedia, the Early British Kingdoms website and a Cistercian site. This picture, taken from a book cover, reproduces the only known picture of medieval date purporting to be of Ælred. 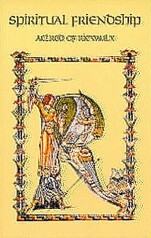 The book is a modern French translation of a life of Ælred writen by a medieval contemporary: La vie d’Ælred abbeé de Rievaulx, by Daniel Walter, translated by Pierre-André. Abbaye Note Dame du Lac, 2004 (Pain des Citeaux; 19). 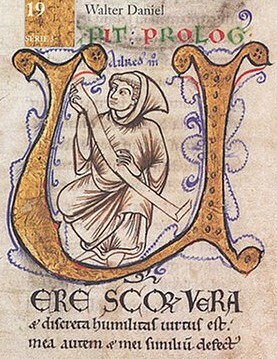 The equivalent work in modern English is The Life of Ælred of Rievaulx, by Walter Daniel, translated by F.M. Powicke. Cistercian publications, 1994 (Cistercian Fathers Series). Walter Daniel entered the the Rievaulx abbey about 1155 and became Ælred’s secretary and, later, the infirmier of the community. In these roles, he became one of the brothers closest to Ælred, his condidant and friend, on which Ælred remarks himself in his work on spiritual friendship. Daniel’s writings are three pieces on Ælred, Abbott of Rievaulx, his life and his death. They concern the Ælred’s life, mourning on his death and a letter about him adressed to a certain Maurice. Both books contain the three texts. It is in fact a great consolation in this life to have someone to whom you can be united in the intimate embrace of the most sacred love; in whom your spirit can rest; to whom you can pour out your soul; in whose delightful company, as in a sweet consoling song, you can take comfort in the midst of sadness; in whose most welcome friendly bosom you can find peace in so many worldly setbacks; to whose loving heart you can open as freely as you would to yourself your innermost thoughts; through whose spiritual kisses-as by some medicine-you are cured of the sickness of care and worry; who weeps with you in sorrow, rejoices with you in joy, and wonders with you in doubt; whom you draw by the fetters of love into that inner room of your soul, so that though the body is absent,the spirit is there, and you can confer all alone, the more secretly, the more delightfully; with whom you can rest, just the two of you, in the sleep of peace away from the noise of the world, in the embrace of love, in the kiss of unity, with the sweetness of the Holy Spirit flowing over you; to whom you so join and unite yourself that you mix soul with soul, and two become one. We can enjoy this in the present with those whom we love not merely with our minds but with our hearts; for some are joined to us more intimately and passionately than others in the lovely bond of spirtual friendship. This prayer is from James Kiefer’s Biographical sketches of memorable Christians of the past. Pour into our hearts, O God, the Holy Spirit’s gift of love, that we, clasping each the other’s hand, may share the joy of friendship, human and divine, and with your servant Ælred draw many to your community of love; through Jesus Christ the Righteous, who lives and reigns with you, in the unity of the Holy Spirit, one God, now and forever. I desire to spend wholly on your people and to consume it all in their service. that your eyes may be opened upon them day and night. Tenderly spread your care to protect them. Stretch forth your holy right hand to bless them. and to inflame them with charity. and strengthen them in all the tribulations of this life. I once jokingly regretted, that my birthday, 28 February, offered me no patron saint. But after more research, sure enough, I found that that St. Oswald of Worcester and York died on 29 February 992 (there are several Saints Oswald) and 28 February has been designated as his feast day. This Oswald became archbishop of York, but he is a disappointment as a role model. The proceedings of a 1992 conference on Oswald’s life and times appear in St Oswald of Worcester: life and influence, ed. Nicholas Brooks and Catherine Cubitt. (London and New York: Leicester University Press, 1996) (Studies in the Early History of Britain: The Makers of England; 2). This book shows Byrhtferth’s Life of Oswald to have been a hagiographic pastiche owing more to the author’s ideals and idiosyncrasies than to direct knowledge of the saint himself. Donald Bullough questions Oswald’s asceticism, while Alan Thacker argues that Oswald used saints’ cults as `vehicles of propaganda’. Andrew Wareham reveals how the bishop’s career profited from the support of his family and how he rewarded them in return. Christopher Dyer damningly reminds us that Oswald presided over the systematic exploitation of the ten thousand or so peasants in the diocese of Worcester. We have an image of a grand and rather worldly prelate, going about from one extravagant festivity to the next with a great band of armed retainers. AELRED, who was the son of a priest, was born about the year 1109, of the noblest blood of England and Scotland, and was trained up at the court of David 1, King of Scots, along with the son of that King, and was a great favourite of the King himself. As his godliness and wisdom grew with his years he determined to bid farewell to the world. To which end he received the Cistercian habit in the Monastery of Rievaulx, in the Archdiocese of York, and later became master of novices there. Then he was made Abbot, first of Revesby, afterwards of Rievaulx in which he was a wondrous example unto all. For he gave himself continuously to the contemplation of heavenly things, and to sacred studies, during which he oftentimes was moved to great devotion. He became noted as an historian and homilist, and in every form of writing he closely resembled Bernard, the honey-tongued Doctor. He refused various dignities in the Church, including a bishoprick which was offered to him by the aforesaid David, King of Scots, in order that he might be the more free to give himself up to contemplation and preaching. At Rievaulx he ruled over three hundred monks. To them he was accustomed to say: My children, speak what ye will as long as there come not out of your mouth any base word, any evil against a brother, or any blasphemy against God. He worked many wonders during his life. He was ill for ten years before his death, and bore great suffering from gall stones and other diseases with wonderful patience, meanwhile travelling about as his arduous duties required. From his excessive leanness his bones were scarce covered with skin. But he who thus was ever so fierce to himself was always most gentle to others, bearing insults patiently, and ever working to foster peace among all men. He died on January 12th, 1167, but in many places his feast is kept on March 3rd. Ælred seems a most praiseworth person to adopt as patron! I identify with his most valuable writings Spiritual friendship and Mirror of charity. As well, I appreciate his fortitude in dealing with physical ailments, as I usually have some ache or pain annoying me. Ælred’s feast is kept by many churches on 3 March, just three days after my birthday.